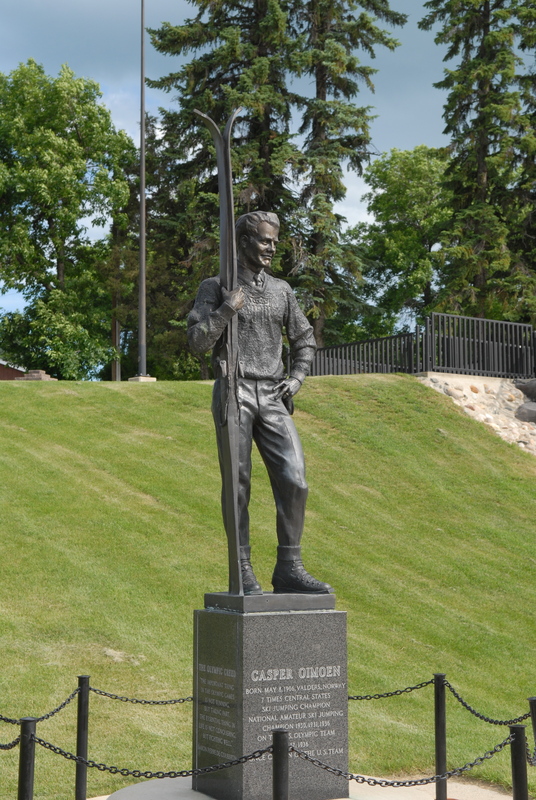 A bronze statue of Norwegian-born Casper Oimoen, who was a long-time Minot resident, stands tall in the park. Oimoen was widely-acclaimed across the continent for his graceful ski-jumping skill. He was a member of the 1932 U.S. Olympic Ski Team and captained the team for the 1936 Winter Olympics. The 1931 official Olympic selection report stated: “Casper Oimen…is the best skier in the United States and because of his outstanding performances this season has been ranked number one on the team and the honor of being team captain.” Casper was the featured jumper at the 1933 Chicago World’s Fair tournament. A Chicago newspaper story said, “…This daring fellow has won more titles…than any other skier.” In 1963, he was inducted into the U.S. 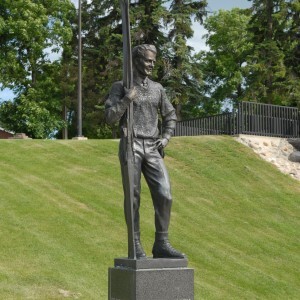 Skiing Hall of Fame and credited with initiating the forward lean to ski jumping in America.